(I posted this elsewhere, but I figured I would also post it here). I also have no Biohazard signs, eventhough I beat the disease. Also, in Nano-Virus, the replicators don't actually work for weeks, but only for a couple of days, however, if you evolve the Cure Overload first, and like a day after the Replicator Overload, the Cure Overload will work for at least 2 weeks, but no longer. The Replicator Overload will work for approximately a week, no longer. The Biohazard/Heart icon in the lower screen statusbar don't work properly. 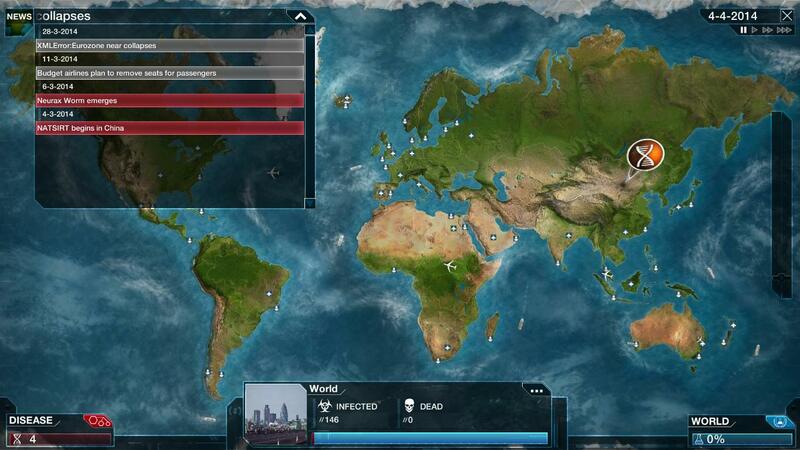 Once infected a country, it will only show the Biohazard icon, no matter if the country is infected or not. I also managed to be able to play with EVERY Genetic Code, even if they are locked. If I just double-click them in the Genetic Code list, they will become activated, and work in-game. 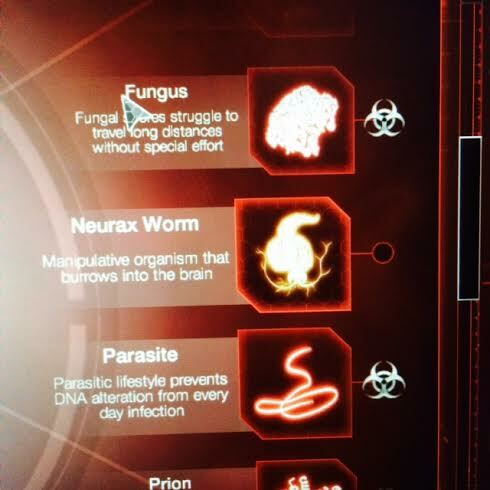 Also, here is a screenshot of unlocking the Necroa Virus. When clicking the Necroa Virus after completion, it will show you the message of non-availability, and safely, go back to the last Disease you played with. I'm really enjoying the game, but I'm going to deposit some of the bugs I've noticed. 1: Occasionally the oceans will "flicker," fixed by reloading the save. 4: When looking at the map of healthy/infected/forsaken countries in the World menu, occasionally an uninfected country will be colored red. 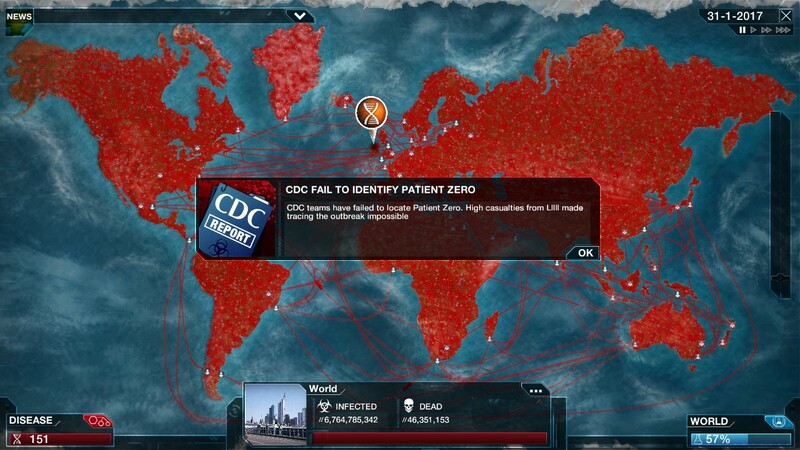 Seen here http://imgur.com/a/CAwfJ where Norway shows up as infected on the map but is totally healthy. It might be related to deaths caused by natural disasters, there had been heavy flooding or an earthquake before I took the screenshot. (03-03-2014 07:36 AM)Mister_Doc Wrote: 4: When looking at the map of healthy/infected/forsaken countries in the World menu, occasionally an uninfected country will be colored red. Also with the gene Metabolic Hijack, if you pop an orange bubles right after the computer does you got the DNA point twice (really effective to beat Brutal Mode). And if you save a game just before you win you can reload it then win again to obtain all genes very fast. Speaking of the DNA bubbles, I don't have anything concrete but the genes that give you more points for popping red/orange bubbles seem hit or miss. Also, while I was playing last night I managed to get both nuclear retaliation achievements in one game. I'm not sure if both events are supposed to fire in one session but hey it was nice having Spailin wipe out two huge research contributors for me. Current time: 21-04-2019, 06:12 PM Powered By MyBB, © 2002-2019 MyBB Group. Theme created by Justin S.